Just in case you haven't already had to exchange a Christmas present that you've already purchased for someone... now comes the rumor from around the web that the new Apple iPad, which is expected to be launched this spring, will have a USB port among other new features. The USB function is potentially a really big deal. Apple makes a decent amount of revenue from the licensing fees it receives from folks who make adapters for their proprietary dock connector. Opening up the market to the USB port would diminish that. However, one of the knocks on the first generation iPad was its lack of USB. It made getting info on & off the device much trickier than it needed to be. While not a deal killer for me, it would still have been a nice feature. However, other rumors are stating that the USB may only be for charging which just seems plain silly to me. You already get an A/C adapter with the device, why would you need 2 ways to charge it? I'm back from New York. This was a seriously short trip for me. I landed at LaGuardia around 7:00 p.m. on Saturday and was back in the air at about 6:15 p.m. on Sunday. I was there to do a lecture for my friends at Ultradent for the Dental Tribune Study Club. The lecture was at 11:20 a.m. so I had about an hour before and a couple of hours afterwards to take a look around the exhibit floor. It was crowded and booths appeared to be doing some good business. The few vendors I had a chance to chat with in t he afternoon told me that sales had been good and that they were optimistic for a good meeting sales wise. My personal opinion is that the economy has turned the corner and that the industry is back. I've also noticed an uptick in the questions I get via email regarding purchasing decisions. Thanks to everyone who took the time out of their schedules to spend an hour with me. I hope you took away a few pearls that you can use to help your patients! West Jordan, UT (November 28th, 2010) – The CAO Group, Inc. (CAO), a worldwide provider of innovative dental devices and materials, is introducing its Sheer Film™ family of products at booth # 5237 during the Greater New York Dental Meeting. Each Sheer Film product employs the most advanced delivery system on the market: CAO Group’s innovative Sheer Film material, which is the optimal delivery system for dental gel materials when contact time, patient compliance and comfort, and non-leakage are essential. Products currently available in the Sheer Film family are Sheer White!™ 20% Carbamide Peroxide Whitening Film, Sheer DesenZ™ Desensitizing Treatment, and Sheer FluorX™ Fluoride Treatment. Remainwhere intended – Sheer Film products will not slip or slide, and can’t be moved by the tongue. Mold to teeth (or gums) – Gels remain tight against the teeth (or tissue), with no fluid seepage down the throat. Controlled release gels – Each Sheer Film product is specially formulated for each specific application. Thin and comfortable – Wear Sheer Film products anytime, anywhere, without detection. Easy to apply – Whether in the office or at home, everyone can easily apply Sheer Film. Faster patient turnaround – Means increased profitability for the dental professional. The unique, flexible backing material of each Sheer Film product enables convenient stretching, bending, molding, and shaping to the individual contours of the teeth and gums for a tight seal. All Sheer Film products contain very specifically formulated gels that deliver the right material at a defined release rate for each application. What’s more, Sheer Films are uniquely designed to enable full-arch treatment or centralized placement. Moreover, Sheer Films are very comfortable and discreet. Unlike traditional, rigid trays or the currently available “strips,” patients are able to wear Sheer Films for hours without detection or discomfort. SheerFilms also grant the user freedom of natural speech and facial expression, making the process convenient at any time, such as in the workplace or at home. Sheer White!™ – Whitens teeth fast. Professionally applied, patient take-home. Replaces trays, gels, and old-style strips. Ideal after in-office whitening. Sheer FluorX™ – An easy and effective professional fluoride treatment. Using 5% acidulated sodium fluoride, it is a more convenient alternative to tray-delivered fluoride treatments, as well as fluoride varnishes. Sheer DesenZ™ – Rapidly relieves oral pain and discomfort associated with dental procedures and temperature changes. All Sheer Film products are sold only to the dental professional, and are available through an exclusive agreement with Henry Schein® Dental. The initial treatment is placed in-office, and the remaining films can be dispensed to the patient for home care. For more information on Sheer Film products, please call 877-236-4408, or log onto www.CaoGroup.com/Dental. The CAO Group, Inc. (CAO), under the direction of Densen Cao, PhD, is headquartered in West Jordan, Utah, with FDA registered and EN 13485 certified manufacturing facilities in West Jordan, Utah and Beijing, China. CAO is one of the world-leading companies focused on understanding and optimizing the use and application of light and biomaterials in dental care applications. Driven by innovative technologies, CAO has been granted or filed more than 150 patents in these high-technology areas, and is recognized as the product development leader in dental materials and devices, especially in LED curing lights and soft tissue surgical lasers. CAO’s mission in dentistry is to make applications of dental materials and devices Easier. Faster. Better™. I'm heading out to the Greater New York Dental Meeting Today. Tomorrow I'll be doing a lecture from 11:20-12:20 so if you are at the meeting, please come by and say hi! One of the greatest things about doing programs like this, other than the learning that I get to receive from the attendees, is getting to see old friends &l meet new ones. If you are in the are, please stop by! Theories and protocols abound on how best to achieve successful bonded restorations. Learn the science of light cured composites and the secrets to routinely achieving sensitivity free composite restorations in a fast paced and interactive format. Participants will learn techniques and principles that they can use the next day back in the office. Learn the science behind light initiated composites. Learn why the curing light is often the overlooked key piece to success. Learn techniques to decrease sensitivity. As a diehard geek I've been excited to see the release of the newest OS for the the iPad, version iOS 4.2 It promised some pretty cool enhancements such as multitasking and nested folders. It has been out in beta for a while, but this week it was officially released and I quickly connected my iPad to my MacBook Pro to grab the new update and put it through its paces. I connected, performed a sync, downloaded and installed the update, and... nothing. Not much, no amazing stuff, nada, zilch. I did notice a new icon called Game Center designed for gaming, of course, but other than that there were no obvious changes. I went into settings looking for something, nope. I checked my software and found I was indeed running iOS 4.2, so where was all the cool stuff? I'm writing this because I'm a geek and a fairly techie guy. And I'm willing to admit that I may have missed something here. I've been pretty busy the last few days and haven't had serious time to devote to the device, but really should something as simple as an iPad require "serious time" to figure out? I know that Apple is famous for its almost Zen instruction manuals that really don't tell you much, but this time I couldn't figure out a thing. I went first to the Apple website and looked around. I could find info about the update, but that didn't really seem to take me anywhere. Maybe I missed something, but really, shouldn't they have made it really easy to find the instructions? Finally I went to my old pal Google, and used that to search for ways to learn about switching between apps & creating folders. Google had the Apple.com pages listed and I was soon on my way. However, it could have been much easier. For the record, now that I know how to do all the cool new things, I really like the update. It should make the iPad experience even better. I still subscribe to the theory that the iPad is a great consumer of media and a not so great creator of media, but if you're living in a WiFi world like me or have the AT&T connected device, it's a much slicker way to consume media than via a laptop. Availability The iOS 4.2 update is available today to download to iPad, iPhone and iPod touch by syncing the device with iTunes 10.1. iOS 4.2 is compatible with iPad, iPhone 3G, iPhone 3GS, iPhone 4, second and third generation iPod touch (late 2009 models with 32GB or 64GB) and new iPod touch. Some features may not be available on all products. For example, Multitasking requires iPhone 3GS, iPhone 4, third generation iPod touch (late 2009 models with 32GB or 64GB) or later. My family - for putting up with what makes me me. You guys are the best. For someone who, in their late 20's, didn't think marriage would ever be possible... and even if it was, kids would not be a part of it, you've made my life the wonderful place it is. I am truly blessed each and every day by having you in my life. Vicki - for the laughs, smiles, hugs, and hard work. For being you and helping me to be a better me. I will always miss you. My staff - for putting up with me, my crazy travel schedule, and my crazy tinkering and experimenting. Thanks also for helping me take such good care of our patients. My patients - for putting your trust in me and giving me the opportunity to do what I truly love to do. Don and everyone at Goetze Dental - It's a great feeling when you're not a customer, but a friend instead. It's no wonder your business is so successful. The Royals - for always giving me something to hope for. You break my heart year after year, but I keep coming back. The "K" - for the smell of fresh mowed grass, popcorn, and nachos. For giving me a place to relax on a warm summer night. For allowing me to spoil myself with season tickets year after year and for the sounds and smells of my favorite game. Paul Feuerstein & Marty Jablow - Because a guy couldn't ask for better crazy dental rock star buddies! David Dodell - Founder of the Internet Dental Forum and a great friend for all these years. The staff at Dental Products Report especially Noah and the beloved "Queen of all Dental Media" Thais Carter - Thanks for the deadline reminders, the encouragement, the laughs, and the dinners. I can't think of a better place to call home for my writing! I'm proud and honored to be the Technology Editor. My pals at Gendex - what started out as a business relationship has blossomed into a great and warm friendship with so many people there. Bob & Michele Lowe - One of my only regrets in my travels is that you 2 aren't at every event that I manage to make it to. I'm really looking forward to the Hinman in 2012! Laurel at Catapult Elite - How in the world you manage to keep track of all the stuff for me that you do... amazing! The guys at American Stonehenge Films - You always make me look good when I'm hosting the DEN. I'm not sure how you do it, but thanks! Barry & Audrey - For the love and the friendship. Only by living at this point in time could a kid from Kansas be lucky enough to have wonderful friends in New Zealand. Here's hoping the All Blacks have a great season! For cool spring days and crisp autumn evenings. I know some people hate the seasons and prefer to live in warmer climates, but to me seeing the seasons change is one of life's great pleasures. For the way the wind whistles through the leaves as I sit on my deck in the early evenings. Tom Baugh - He helped make my dream of a new office an amazing reality. He made going to the office every day a moment I treasure and he became a really great friend in the process. Technology - It makes my life easier and gives me a purpose other than dentistry. I know there are others, but I think that's a pretty good list. Thanks also to all of you! Those of you who read this blog, read my articles in Dental Products Report, and come see my lectures make all of this worthwhile. I'm honored that you take the time to let me into your lives. It is an honor that I am truly grateful for and truly treasure. Now go spend time with the ones you love. That is truly what Thanksgiving is all about! The innovation at Curve just keeps rolling along. Yesterday I got this press release with a promise from them that I can beat the major media outlets by 48 hours. How cool is that? With a small and nimble team of developers, Curve is able to make changes and provide services in a way that only startups can. This is a great example of that philosophy. OREM, UT—Curve Dental, creators of Web-based dental software, announced their development of an iPad app that will modernize the way in which patient information is gathered and digitized in the dental practice. Using the new app, called Curve Questionnaire, the dental practice can create check-in, medical history and other types of forms for their patients to complete using an iPad. Data entered by the patient is written directly to Curve Dental’s Web-based dental software when the patient submits the questionnaire. Using the app, the dental practice can create any number of different forms or questionnaires depending upon their needs. The practice can determine what questions to ask and how each question can be answered, whether with a yes or no response, multiple choice, or open-ended. The Curve Questionnaire app will be available to all Curve Dental customers without charge. The app will also complement Curve Dental’s Web-based dental software. Here is an announcement that came from the Institute of Medical Emergency Preparedness. The group does a great job of monitoring and notifying of device problems/recalls as well as medicine recalls like this one. For more info about them, visit their website. ISSUE: FDA notified healthcare professionals that Xanodyne Pharmaceuticals has agreed to withdraw propoxyphene, an opioid pain reliever used to treat mild to moderate pain, from the U.S. market at the request of the FDA, due to new data showing that the drug can cause serious toxicity to the heart, even when used at therapeutic doses. FDA concluded that the safety risks of propoxyphene outweigh its benefits for pain relief at recommended doses. FDA requested that the generic manufacturers of propoxyphene-containing products remove their products as well. BACKGROUND: FDA’s recommendation is based on all available data including data from a new study that evaluated the effects that increasing doses of propoxyphene have on the heart (see Data Summary in Drug Safety Communication). The results of the new study showed that when propoxyphene was taken at therapeutic doses, there were significant changes to the electrical activity of the heart: prolonged PR interval, widened QRS complex and prolonged QT interval. These changes can increase the risk for serious abnormal heart rhythms. RECOMMENDATION: FDA recommends that healthcare professionals stop prescribing and dispensing propoxyphene-containing products to patients, contact patients currently taking propoxyphene-containing products and ask them to discontinue the drug, inform patients of the risks associated with propoxyphene, and discuss alternative pain management strategies. Patients were advised to dispose of unused propoxyphene in household trash by following the recommendations outlined in the Federal Drug Disposal Guidelines. Elecom Headphones for iPod Shuffle - Who Needs Bluetooth? Now don't get me wrong. I mean I love Bluetooth. I have it in my truck as well as having a headset, headphones, and a presentation mouse all using the Bluetooth standard. The wireless standard makes my life easier and cuts down on lots of wires... what's not to love? And yet, there are those times when less can be more, or at least a steady equivalent, and this is one of those times. It seems the smart people at Elecom came up with the very bright idea of making the latest iPod Shuffle totally portable and wireless. Now I know the Shuffle is portable. Heck the dang thing is about the size of a box of matches... maybe smaller, but the wired earbuds can be a bit of a pain when dealing with any MP3 player; even one as tiny as the new Shuffle. Now if you don't want wires, you can certainly find some very good Bluetooth headsets like this one that I happen to own. But if you'd rather have a regular "wired" type headset without the wires, Elecom has your solution. The idea is beautiful in its simplicity. There is a headphone plug on the headphones and the Shuffle simply slides onto it and is held in place directly on the side of the headphones. The result is a totally portable wireless headphone system. Oh, and it's only $50 which isn't rock bottom cheap, but it isn't breaking the bank either. I haven't had a chance to evaluate these so I have no idea what the sound quality is, but it's a great concept/idea as far as better mousetraps go. Looking to secure your documents and files? Nowadays who isn't? If that's the case then take a look at docLock. It's something I'll be evaluating in the next few weeks and I'm excited to be able to use it. SAN DIEGO, Calif. (November 16, 2010) – Large Software, a provider of easy-to-use consumer software including PC Tune-UpTM, announced today the launch of docLockTM, a software tool that allows users to protect and secure files and folders on their PC with military-grade password protection – all with just a click. In addition to protecting sensitive data, the software also makes managing this protection a breeze –with advanced features such as a password generator and a “visual password” function that allows users to conceal their hard-to- remember password in a photo. Since data must often be shared, the software offers a host of ways to securely share protected documents, photos, videos, Zip files, PDFs (or even entire folders) with others – even if they don’t have the software. Users also have the option to securely create portable versions of protected documents that can be easily transported via memory stick, USB drive, flash drive, external hard drives, or other mobile storage device. An ideal gift for the holidays, docLock is available at a reduced price of $29.95 for a limited time (MSRP of $49.95 thereafter). docLock offers complete protection and management of users’ computer data. Use docLock to protect computer files such as tax returns, financial documents, credit information, medical records, photos, videos, etc. In addition, docLock goes a step further with its protection to include features such as “Secure Delete” and “Clean Free Space” which make it easy to remove files and free space so that deleted files will be completely unrecoverable – especially useful for those who may be upgrading to a new computer this holiday season. For added convenience and quick sharing, docLock allows users to e-mail locked files to recipients that might not have docLock installed, and to make all locked files portable by transferring locked files from PC to PC using any USB/Flash drive, again without having to have docLock installed. Large Software® is an innovative software solution provider that applies new thinking and ideas to create simple, valuable, and trusted experiences with technology. The company’s premier product, PC Tune-UpTM, enables users of all technical levels to quickly and easily clean their computers and keep them running smoothly. Large Software is a privately-owned company that was founded in 2006 by NNJ Corporation. The company is headquartered in San Diego, California. For more information, please visit www.largesoftware.com. Although this doesn't really surprise me, I thought I would report on it nonetheless. As a lot of you know, I'm an Amazon Kindle owner as well as being an iPod owner. Both of the devices allow me to read books electronically. In fact, the iPod has an Amazon app that allows me to read my Kindle books on the iPad. NEW YORK--(BUSINESS WIRE)--The New York Times announced today it will publish eBook fiction and nonfiction Best-Seller Lists beginning early 2011. "The best-seller list is an essential part of the Book Review, and we're excited we'll be able to give readers newer and more complete information," said Sam Tanenhaus, editor of The New York Times Book Review. The rankings will reflect sales aggregated from a growing number of online service providers who sell eBooks to consumers. To further secure the integrity of the rankings, The Times is aggressively developing a means of processing and displaying the information necessary, and of verifying the data provided. The Times has entered into a relationship with an independent third party, RoyaltyShare, Inc., whose unique, Web-based software platform will be used by the staff of The New York Times Best Seller Lists to help validate eBooks sales data received from various sources. As new devices continue to captivate readers, the eBook category has seen tremendous growth. The Association of American Publishers recently reported that eBook sales for the first eight months of the year were up more than 190 percent, generating nine percent of total consumer book sales. The lists will appear in The New York Times Book Review both in print and online editions. Rankings will reflect sales for the week at many venues where a wide range of general interest eBooks are sold nationwide. These include independent book retailers; national, regional and local chains; and online and multimedia entertainment retailers. The New York Times Company, a leading media company with 2009 revenues of $2.4 billion, includes The New York Times, the International Herald Tribune, The Boston Globe, 15 other daily newspapers and more than 50 Web sites, including NYTimes.com, Boston.com and About.com. The Company’s core purpose is to enhance society by creating, collecting and distributing high-quality news, information and entertainment. Raven Window is a pretty cool product. The idea is similar to the idea with self tinting eyeglasses. One of the biggest problems we have with windows is the need for light leveraged against the need to combat incoming infrared radiation that drives up room temperatures and forces A/C units to work harder. Wouldn't it be great if your window was clear when you needed the light and then tinted when it was in the direct sun? Well... you guessed it, now it can be! Until now, windows have been part of the energy problem for architects, builders and building operators. Sunlight from windows raises indoor temperatures, forcing air conditioning systems to run more often. They allow heat to leak outside, making buildings less efficient in cold temperatures as well. RavenWindowTM smart windows an integral part of a building's energy conservation strategy. Thanks to a breakthrough in smart window technology, RavenWindowTM automatically adapts to outside temperatures to reduce the need for air conditioning and heat. On hot days RavenWindowTM reflects the sun's light and heat away from the building, keeping indoor temperatures cooler. 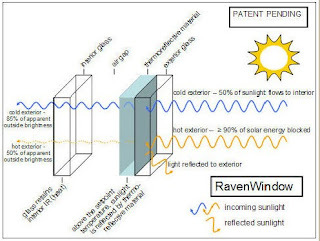 When outdoor temperatures drop RavenWindowTM becomes transparent, letting free solar heat inside. RavenWindow's flexible thermoreflective technology creates substantial energy savings in all four seasons. Maybe you've heard the story. In 1976 a couple of kids began assembling a circuit board type computer in a garage and selling it via mail order. Those kids were Steve Jobs and Steve Wozniak and the computer they were selling, the Apple-1, is considered by many to be the first true personal computer. The kids tried to get Atari to help them and they also tried to get HP involved but neither company was interested. Bet they are regretting that decision, huh? 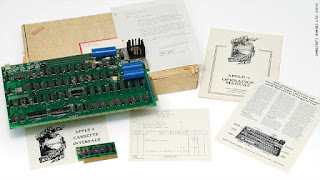 Anyway, one of those original Apple-1 devices is going up for auction. Here is the full story from CNN. Lexington, Kentucky – QED Medical a US based manufacturer and distributor of surgical lighting systems for the dental and medical disciplines since 1971 introduces the ALOS-TTL through the lens video headlight system now available to the dental market exclusively through High Q Dental. The ALOS-TTL system provides a lightweight, user friendly method for collecting – or showing real time – line of sight footage of procedures, with zero parallax, from the doctors point of view. The systems new “pin-hole” lens technology, allows the ALOS-TTL to deliver exceptional depth of field to facilitate operator motion without the risk of drifting out of focus, while the CCD chip provides exceptional image resolution. The ALOS-TTL allows others the opportunity to see a procedure exactly as they will when they themselves will perform the procedure they are learning. This system puts every viewer in the shoes of the doctor performing the procedure. Whether demonstrating in real-time or recording for future use, the ALOS-TTL system is a powerful tool for the School, lecturing doctor, Study Club, manufacturer’s demonstrating product, or anyone interested in cataloguing procedures. The ALOS-TTL System includes the Altair HI 2 Fiber Optic Headlight with integrated TTL Camera and Pin-Hole Lens, Camera Control Unit (available in NTSC or PAL), Universal Power Supply and Nova 3 200-watt Light Source. High Q includes standard composite and S-VHS cables allowing the image to be directed to most available recording or viewing devices. For more information on High Q Dental, please visit our web site at www.highqdental.com, call High Q at 1-800-775-3433, fax 480-905-0794 or E-mail at sales@highqdental.com. A short post today. I'm still grieving from Monday's loss of Vicki, but I know she would be after me to keep on doing what I do. So... Mac has today released the latest update to their Snow Leopard operating system. It contains a myriad of fixes and security improvements. It's also a huge download at over 1/2 a gigabyte so only attempt the download on a broadband connection! On Monday night, my friend and treatment coordinator Vicki passed away suddenly. In the 6 years that she had been in my life, Vicki had gone from being an employee to being so many other things in my life. She was words of encouragement when I needed them and a kick in the seat when words weren't enough. She was the highly organized center of my front office team and a bundle of energy that just couldn't stop. Most of all she was my very close friend. A partner in helping my business and in helping my patients. I could always count on her to do "the right thing" and I trusted her with so much. She was a proud mother, a delightful spirit, and truly larger than life in so many instances. My life is better for having her in it and emptier now that she has moved on to the next plane. Monday night as she left the office we exchanged our usual "See you tomorrow!" evening greetings. Unfortunately this time it wasn't true. I'll never see her again in this world, but I AM confident I'll see her again. Of that, I have no doubt. As I told the staff today in a closed and quiet office, in a few days heaven is going to be a lot more organized! One thing I'm grateful for is that we often told each other how lucky we both felt to have each other in our lives. So many times things like this happen and we regret that we never told someone how important they are. The "Blade" SSD that is currently gracing the new MacBook Air could be showing up in other hardware sooner than you think. 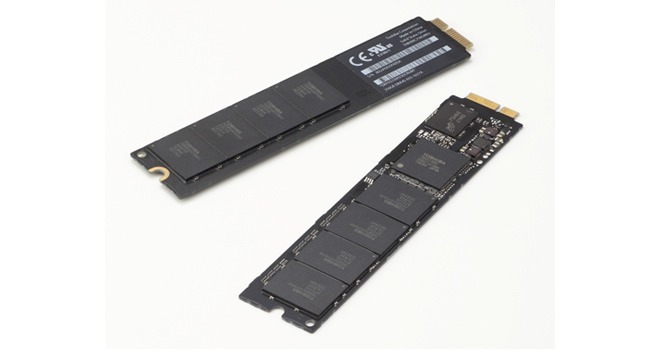 These "wafer thin" SSD's are blazing fast and have capacities of 64GB, 128GB, and 256GB. IRVINE, Calif., and TOKYO, Nov. 7, 2010 /PRNewswire/ -- Toshiba Corp. (Toshiba) and Toshiba America Electronic Components, Inc. (TAEC)* today announced the Blade X-gale™ SSD series, an innovative new form factor in high capacity, high performance solid-state storage. Available now, the new drives are offered in capacities of 64-gigabyte (GB) (1), 128GB and 256GB, with a maximum sequential read speed of 220MB per second (MB/s) (2) and a maximum sequential write speed of 180MB/s. Ideally suited for integration into space-sensitive products, including tablet PCs, laptops, mini-mobile and netbook PCs, Toshiba's latest SSD offering helps these devices achieve a super slim profile. As mobile devices get smaller and lighter, yet even more feature packed than ever, the SSDs inside them – the heart of storing all of the music and other entertainment data – must be even smaller, and much thinner. Toshiba's new 64GB and 128GB Blade X-gale SSDs are the thinnest available within the company's comprehensive portfolio of SSD solutions. At a thickness of 2.2mm, the modules are 42 percent thinner than that of a typical mSATA SSD, and Toshiba's advanced wiring technology has assured optimized wiring layouts and data transfer rates in this new form factor. Thanks to Toshiba's base design technology that minimizes board warpage during thinning, 256GB capacity can be achieved when mounted on both sides, the largest density in the industry for small type SSD modules. Toshiba also offers designers a choice of mSATA and Half-Slim SSD modules in capacities up to 128GB. "Until recently, storage designers looking for high capacity storage had accommodated the size of HDD into their designs," continued Nelson. "Up to this point, SSD designs also followed the basic design of small form factor HDD - which does not fully leverage the capabilities of high density NAND technology. Toshiba's module-based SSDs break with this approach, giving hardware designers greater freedom and flexibility in enabling their product design." As regular readers know, I'm a huge proponent of backing up. If you don't, eventually it's going to catch up to you. Every hard drive fails... or, heaven forbid, a physical disaster occurs. 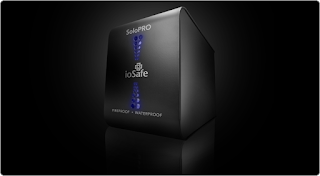 To help you get through this, there's ioSafe. The company makes unique products that are basically totally survivable hard drive backup systems designed to survive both extreme heat from fire and also being submersed in water. The company has just recently released the new SoloPRO device and I'm going to be doing some testing on it starting later this week. As a health care provide, the survivability of my data is the most critical parts of my business strategy. Take a look at this story that shows how valuable an ioSafe device can be. This is high tech from way back in the day. This is a utensil from the days of the Roman armies. When I saw it, I just had to do a post on it. It is an "eating implement, folding, with three-pronged fork, spatula, pick, spike and knife". I'm guessing this was probably the early version of the Roman Army Leatherman. For all the details, visit the Fitz Museum website. On Friday, I spent the day lecturing at the Buffalo Niagara Meeting on Predictable Endo for the General Practitioner. Thanks to everyone who came out and spent the day with me. It was a great crowd and I can't tell you how humbled in I am that you all stayed with me to the very end. I hope you all went home with some great tips to improve your care and to improve the lives of your patients. That's what it's all about, after all. I also wanted to thank the good people of United Airlines for their excellent service in helping return a lost item to me. I'll probably do a whole post on that at a later date, but suffice it to say that was extremely impressed by their folks at the Buffalo airport. Malvern, PA (November 1, 2010) – DentalEZ® Group, a supplier of innovative products and services for dental health professionals worldwide, is pleased to introduce DEZiree the Dental Hygienist. DEZiree is the star of a new video blog recently created by the DentalEZ Group called The DEZiree Show. A positive representation of the modern hygienist, DEZiree promises to be a familiar face in the dental community. DEZiree will star in a weekly video blog that interested hygienists and dental professionals can opt-in to view through weekly e-mails. The blog provides weekly updates of useful information and news regarding topics geared solely toward the dental hygiene profession. The new blog will be an ongoing showcase of DEZiree presenting 30- to 90-second video segments covering a variety of topics relevant to dental hygienists. DEZiree will present the latest industry news, exclusive promotions, new product announcements, and tales from the chairside that dental hygienists will surely identify through their everyday personal and professional experience. Dental hygienists can opt-in to receive weekly e-mails for The DEZiree Show by logging onto www.thedezireeshow.com, where The DEZiree Show is housed. The new DentalEZ blog also features a forum for dental hygienists to discuss daily events and products among their peers. To sign up for The DEZiree Show weekly newsletter, or for more information, please log onto www.thedezireeshow.com. DentalEZ® Group is committed to advancing the practice of dentistry through innovative products and services. Encompassing six distinct product brands—StarDental®, DentalEZ®, CustomAir®, RAMVAC®, NevinLabs™, and Columbia Dentoform® — DentalEZ® Group manufactures everything in the operatory, from handpieces to chairs to vacuum systems to dental simulation models, creating a complete line of products to elevate the health, comfort, and efficiency of the dental operatory. For more information, please visit www.dentalez.com. I got a chance to see this product at the ADA meeting in Orlando last month. CAO is a company that has been making dental products for a while now, but they've been making them for other companies. Now the company has decided to enter the market directly. West Jordan, UT (November 1, 2010) – The CAO Group, Inc. (CAO), a worldwide provider of innovative dental devices and materials, is introducing the first member of its revolutionary Sheer Film™ family of products, Sheer White!™ teeth whitening films. Consisting of thin, flexible films plus 20% carbamide peroxide gel, SheerWhite! is easily applied, molds to teeth, stays where placed, and whitens teeth fast. SheerWhite! sets a new standard for take home whitening through professionals. New SheerWhite! teeth whitening films employ the most advanced delivery system available today. Using CAO’s innovative and proprietary thin, flexible Sheer Film material, SheerWhite! teeth whitening films are easily molded to individual tooth shape and cover from approximately first molar to first molar. The Sheer Film material molds tightly to the teeth, ensuring complete contact of Sheer White!’s whitening gel to enamel and effectively preventing washout or leakage down the patient’s throat. Moreover, SheerWhite! teeth whitening films are very comfortable and discreet. Unlike whitening trays or old-style “strips,” patients are able to speak clearly, so Sheer White! teeth whitening films can be worn anytime – at work or even overnight. SheerWhite! is the new and better alternative to traditional whitening products such as tray delivery or strip products. SheerWhite! is also the perfect complement to in-office whitening, as patients usually must finish treatment at home. With SheerWhite!, there is no tray to fabricate, no lab costs, and whitening can begin immediately. Sheer White! is the first CAO product featuring the company’s revolutionary SheerFilm™ material. Over the next several months, CAO will utilize its SheerFilm™ material to effectively deliver medicaments for desensitizing and fluoride, and more. SheerWhite! teeth whitening films are distributed exclusively through Henry Schein Dental to the dental profession. The Sheer White! Introductory Kit contains six (6) Patient Treatment Kits; the Sheer White! Bulk Kit contains 24 Patient Treatment Kits. Each Patient Treatment Kit provides a complete five-day whitening regime. SheerWhite! has an 18-month shelf life. 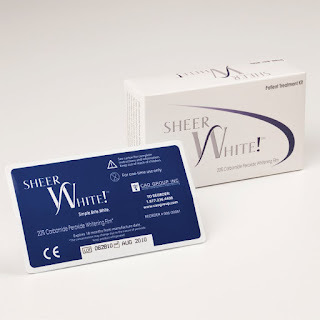 For more information on Sheer White!, please call 877-236-4408, or log onto www.CaoGroup.com/Dental. On September 24th we began our clinical testing of the Anteriorest System. The system is designed to attach to the patient chair and provide back support from the front. What a concept! Rather than trying to maintain my posture with my back muscles tensing, I now lean forward against the Anteriorest pad and let my back relax. I'm fully supported doing dentistry without the effort normally required. You know, the effort that makes your back and neck hurt at the end of the day. Over 60% of dentists who become disabled, become that way due to neck & back injuries. Everyone in the field knows a few people who are either suffering with these types of problems or have been forced to stop practicing. Anteriorest is the one product that may very well help prevent these types of problems as well as extending the careers of those suffering with these types of problems. In my 6 weeks with the device, I've found it to be easy to use and that it works exactly as advertised. It has quickly become a part of my everyday clinical routine and I leave the office in the evening feeling much less back fatigue. The device was easily installed and is used by staff members as well. This product can change the lives of our profession for the better and is highly recommended. I've been a lucky man in my life. I have been blessed with many opportunities and had the good fortune to be around a lot of great people. One of them is Paul Feuerstein. Paul is a giant in the dental industry and is an expert on anything to do with technology in the profession. He's a great man and an even greater human being. It is with great pride and affection that I call him my friend. When I got this press release, I couldn't have been happier for him... Or more proud. Way to go Paul!!! Berkeley, CA (November 1, 2010) – The Eco-Dentistry Association™ (EDA), an international membership association formed to promote environmentally sound practices in dentistry, recently appointed Paul Feuerstein, DMD, a practicing general dentist and one of the industry’s most prominent technology leaders, as the organization’s newest Advisory Board member. As an EDA Advisory Board member, Dr. Feuerstein will act as an informational resource for the EDA and its members on how to create and maintain a green practice through the latest advancements in dental technology. He will provide the organization with ongoing insight, feedback, and validation on a variety of functions, including product evaluations and certifications, training programs, public relations, and continuing education program development and research. The EDA regularly apprises its Advisory Board Members of new developments in the organization to seek their advice and counsel. “Dr. Feuerstein will be doing everything from providing guidance on our program offerings to speaking on behalf of the EDA to the trade and mainstream press,” said Pockrass. Dr. Paul Feuerstein graduated from the New Jersey College of Medicine and Dentistry in 1972. He received his B.S. at SUNY Stony Brook in 1968. Today, in addition to continuing to practice dentistry, Dr. Feuerstein serves as a consultant to the dental profession, and is a lecturer to dental associations on technology-related topics. Dr. Feuerstein was recently appointed Adjunct Assistant Professor at Tufts University School of Dental Medicine in General Dentistry, a facility that has achieved the US Green Building Councils, LEED Silver Certification. The school is dedicated to training doctors of dental medicine as expert clinicians. In this role, Dr. Feuerstein has the opportunity to introduce the latest technologies to the students, faculty, and CE course attendees. In January, Dr. Feuerstein was presented with the Clinician of the Year Award by the Massachusetts Dental Society (MDS). The award was presented to Dr. Feuerstein during a ceremony at the 35th annual Yankee Dental Congress®, which is one of the largest dental meetings in the country. Dr. Feuerstein can be reached by email at drpaul@toothfairy.com. The EDA is an international educational membership organization that provides standards, best practices, and certification for green dental offices and green dental products and services. The organization also provides the public access to dental professionals who share their values of wellness and environmental stewardship. More information can be found at www.ecodentistry.org.